Does anyone watch VH1 anymore? “Best Week Ever” was a hilarious show, recapping the highlights of the week. My guilty pleasure was Poison lead singer Bret Michael trying to find true love with anything-but-normal women for three seasons. Well, the kind-of sort-of music channel recently debuted a new guilty pleasure in reality TV. “Off Pitch” focuses on the performances and antics of a show choir for adults (one of the founders believes the group is the only adult show choir in the country). Why am I so interested in this new reality show? Because the adult show choir is from La Crosse, Wis. – my place of residence. And when I say the word “interested,” I’m more interested in identifying the background of the city than the premise. Prior to the show, I’ve heard of the Grand River Singers but I didn’t really know anything about the group. I figured the show choir was from one of the local high schools since most of the twentysomething members look quite young. When I watched the trailer for the show before the premiere, I honestly thought, “Wow. I hope this doesn’t make us the Jersey Shore of Wisconsin.” Guilty pleasure shows always includes crying, fighting, screaming, drinking, gossiping, and just running around without reason. While I didn’t expect the Grand River Singers to be a super serious show choir acting in a professional and business-like manner, I just hoped the members somehow avoided the reality TV stereotypes and clichés. On second thought, can anyone really avoid a stereotype? Despite the crazy antics and behavior of some show choir members, I’m hopeful La Crosse will avoid the “Jersey Shore of Wisconsin” label. My fingers are crossed. At least the members aren’t roommates living in one big house, getting intoxicated every single night, picking fights with each other or strangers, prancing around in little to no clothing, or hooking up with each other or strangers. With daytime jobs, rehearsals, and performances, the cast looks too busy – and too sensible, maybe? – to engage in “Jersey Shore”-type behavior. Not to mention, the show’s focus is about the show choir not the members’ extracurricular shenanigans. Between heavy editing and on-camera awareness (“Look at me!!! I can do cartwheels!!! ), I wonder how much of the show is real. But unnecessary high drama makes for guilty pleasure, I guess. On a side note: Charlie briefly worked with two of the choir’s new members – Eric and Justin — during a theater production at the university they attend. He praised both as being incredible singers and performers. I don’t doubt the cast’s talent – all seem to be pretty solid singers and performers. At least they’re not the honestly untalented outcasts that “American Idol” takes potshots at during the auditions. Strip away the drama, crazy antics, and mugging, and the audience gets a glimpse inside the life of a twentysomething kid who just loves to sing and dance. But throw the drama, crazy antics, and mugging back into the mix, and the audience indulges in an acceptable guilty pleasure reality TV show. Between one episode and various previews for the show, I like watching the show for known landmarks in my city and whether I’ve bumped into any members. 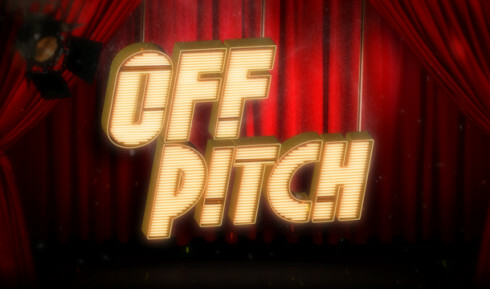 At this point, I have no idea whether “Off Pitch” will be wildly successful or win over everyone’s hearts. A few of my co-workers watch the show since they either know one of the cast members or one of their kids know someone on the show. I just wish the cast members luck with everything that comes with 15 minutes of fame. If Honey Boo Boo, “Sister Wives,” “Duck Dynasty,” and other crazy reality shows can find an audience, then maybe “Off Pitch” has a chance to sing and dance their way to some sort of success. Although if actress Eva Longoria can’t successfully produce a reality show (NBC’s “Ready for Love”), then what are the chances for “Off Pitch”?